The game is over, the players are off the field, but the football coach wants to review the video footage to get a handle on next week’s challenges. For Mississippi State University’s Bulldogs, that’s no problem. Brock Dulaney, video and computing services coordinator for the school’s athletic department, uses the GX Disc Publisher from Microboards Technology to get the coach a DVD of game footage within hours of the game. "I just edit it, throw it in the burner and go. It’s amazing how fast it can spit those things out." Dulaney says the publisher is a vast improvement over manually burning DVDs and then handwriting the labels. Mississippi State, part of the SEC conference, exchanges footage with other conference schools and also submits game highlights to the NFL, which analyzes the DVDs for future drafts. "I typically burn anywhere from 25 to 40 copies of each DVD. The GX Disc Publisher makes the DVDs we send out look a lot more professional," Dulaney explains. By using the included SureThing Label Designer and Zulu2 software, Dulaney customizes the DVDs with backgrounds, images and text—using HP thermal inkjet technology with dye-based, aqueous HP Vivera ink for brilliant colors and unequaled image quality. The results even impress Dulaney’s most critical audience. "The coaches are so impressed with how nice the DVDs look now. Coaches aren’t the biggest ones to give out compliments, so if you do get one, you’re doing pretty good!" The Bulldogs aren’t the only ones earning rave reviews for their professional-looking DVDs. While they ship their DVDs to other colleges in their conference and the NFL, Rich Jayne, producer for Elite Racing sports marketing, uses the Microboards GX Disc Publisher to create and print DVDs for ESPN and Fox Sports Net. Elite Racing films marathons across the country. Typically, they send DVDs of the events to sponsors and attendees, as well as to sports networks. Until last year, they outsourced DVD creation to a local company. But when the vendor significantly increased the fees for small- to medium-run DVDs, Jayne looked for another option. He found the answer with Microboards. "When we were outsourcing, we had to guess how many we needed. Now we can print just what we need without a lot of waste." And since HP thermal inkjet technology is designed for maximum ink efficiency, the Microboards Disc Publisher helps keep costs down by printing more with less ink. This on-demand process also avoids the significant turnaround time inherent to outsourcing. Jayne is impressed with the publisher’s reliability, and often leaves it overnight to print out 50 or more DVDs. "It goes through the whole batch reliably, and it prints logos and text that look great," he says. The Music Conservatory of Texas is also pleased with the product’s speed and quality. The school uses a Microboards GX Disc Publisher to burn and print DVDs of student recitals. While an audience analyzing music is quite different than an audience analyzing marathon results or referees’ calls, the results are equally well received. Steve South, school director, (pictured), described how easy the Publisher makes the process. "When we started giving out DVDs of our twice-yearly recitals, we were burning one at a time on a PC. It took forever! The GX Disc Publisher quickly and affordably burns and prints all our DVDs. In two recitals, it paid for itself. " And the quality? Top notch. "I’ve used it to print photos and text on the DVDs, and I’m always pleased with the results," he says. "The color is excellent, the ink cartridges last a long time, and the text looks clear and sharp. When you factor in the quality with the amount you can print and the cost of the ink cartridges, it’s a great combination." Quality, speed and value. Whether it’s used for sports footage, music recitals, or a variety of other events or applications, the Microboards GX Disc Publisher series produces results that mean business. Brock Dulaney, MSU video and computing services coordinator, recently sat down for a candid interview about how the GX Disc Publisher has changed his collegiate football video operations. You work at Mississippi State University. What do you do there? 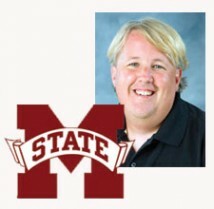 I’ve been at Mississippi State for 12 years and 13 football seasons. As video and computing services coordinator, I oversee a staff of six that is responsible for filming all the athletic events. I film the football games, and after each game, I make a DVD of the footage for the coach to review. We also exchange footage with other schools in the SEC conference and submit DVDs of game highlights to the NFL, which analyzes them for future drafts. What do you use to burn and print these DVDs? We use the Microboards GX Disc Publisher, running it on a PC. I typically burn anywhere from 25 to 40 copies of each DVD. The GX Disc Publisher makes the DVDs we send out look a lot more professional, and the coaches are impressed with how nice they look too. How did you create the DVDs before you had the Microboards GX Disc Publisher? We used to burn them one at a time on a PC and then write the game details on each DVD by hand. But then we discovered the Microboards Disc Publisher. The price of this quality disc system made it really appealing. When you factor in the quality with the amount you can print and the cost of the ink cartridges, it’s a great deal. And it’s fast! All I do is throw the DVDs in the burner and go. The footage is ready for the coach to take home and analyze that night—it’s that fast. And the DVDs look so professional—I’ve printed both pictures and text on the DVDs, and the colors are almost identical to what I see on my screen. Microboards included SureThing Label Designer and Zulu2 software with the publisher. Both are really easy to use and make customizing the DVDs each week a breeze. This sounds pretty professional. Is the Microboards GX Disc Publisher a large piece of equipment? No. It’s small and sits right on my desk. It’s great for having in an office. I like that it doesn’t take up a lot of space compared to products I’ve seen from other companies. What do you feel is the biggest benefit to having this product? By far, it’s that the products we send out now look so much more professional. Also, the speed with which I can produce the DVDs—having them ready an hour after the game for the coach is perfect. We’re definitely big time now!